I found this lesson on the Columbia Education Center’s website and think that it is a great idea. Basically it is a challenge for students to make nutritious meals for $60 a week and to find all their pricing and food choices from local grocery store fliers. 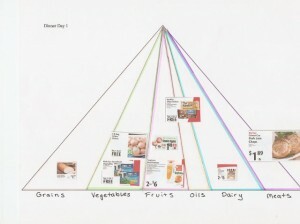 The students would cut out what they wanted to purchase and paste them on a food pyramid chart for each meal. The students would then total the amount of dollars spent and estimate the amount of calories consumed for each meal. Some additional ideas that I would add to this lesson is to allow the students to use online grocery stores like PeaPod for New England and Safeway for AZ, CA, MD, OR, VA, WA, and DC to find their grocery prices. The reason I suggest using online grocery stores is because students can see the serving size and nutrition labels for each item they want to purchase therefore they would not have to estimate the number of calories for each item. The grocery cart will also calculate how much their meals cost once they put them in the “basket” as well eliminating some math or you can just keep that to yourself. If you don’t have a grocery store that delivers in your state the trick is to use a zip code from a city that the store delivers to which will allow your students access. You probably will want to discuss some tricks to grocery shopping frugally. Here are some websites that have good grocery shopping tips.